Replacement decal for Bally drop targets. 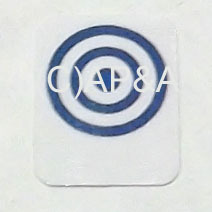 Blue 'bullseye' design on white background. Install over worn hot-stamped design on used targets to restore like-new look. Easy to install- just peel and stick! Sold individually.